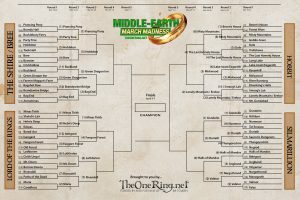 The Lord of the Rings bracket saw Minas Tirith take three quarters of the vote to see off Helm’s Deep; clearly Rohan is no match for Gondor! The power of the elves was in evidence, as Lothlorien and Rivendell easily defeated Mount Doom and Moria respectively. And as one would expect, Fangorn Forest overthrew Isengard; the filth of Saruman is washing away… Now the ents must march to the white city; and we have an elvish smackdown! Who will be victorious when Rivendell takes on the heart of Elvendom on earth? YOU decide! Vote now! The closest battle of Round 2 was in the Hobbit locations; the Misty Mountains ultimately vanquished Beorn’s House, but with only just over half the vote. Smaug’s Lair was conquered by its host, the Lonely Mountain; now Erebor faces Mirkwood, as that ‘tree infested’ area overcame Lake-town. Elves were winning in this bracket too, with the Last Homely House taking over 60% against Dale. In the Silmarillion category the men of Numenor have been conquered by Gondolin, after putting up a brave fight but only being able to take 40% of the vote. The good guys are dominant in the rest of this category, with Doriath, the Halls of Mandos, and Valinor all cruising to victory, over Angband, Thangorodrim and Nargothrond. 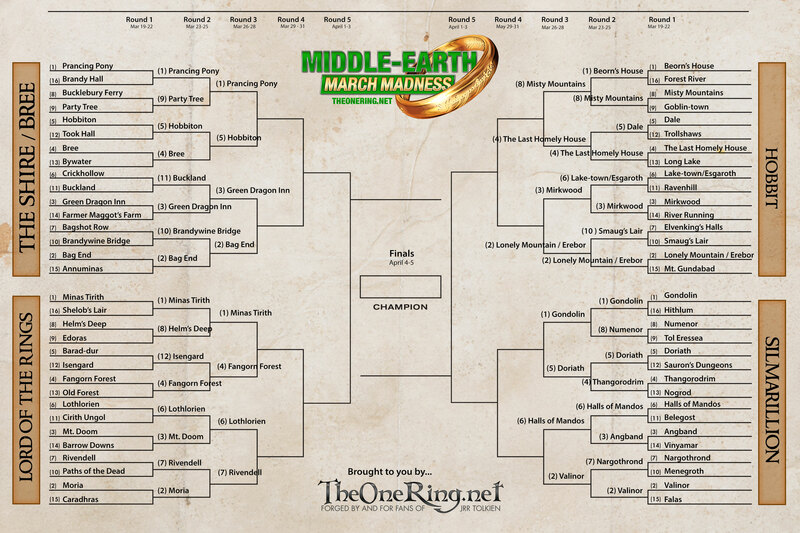 Valinor is definitely the location to beat in this bracket; can the Halls of Mandos put up a good fight in Round 3?